Welcome Round 22 OctaFX Champions! Meanwhile, our OctaFX Champion Demo contest Round 22 is over, and Round 23 is already on! While newbies practice to get our prize pool of 1000$, let’s see the details of Round 22! This time, 2067 traders took part in our international race, and sped up to the finish line, gaining experience and living every minute of it! Following the tradition, we award 3 winners and 1 last runner and present you their stories of success! The last runner in the contest Mr. Kurdi SE from Indonesia is granted 100 USD. The interview of our winners will convince even the most insecure traders to participate and become an OctaFX Champion! How do you feel being an OctaFX Champion? 1st place – Mr. Effendi Setiawan: Alhamdulillah, I am very happy to be a champion. 2nd place – Mr. Siegfrid Tampubolon: I'm thrilled, very happy being one of the champion list. I'm off trading almost 2 years now but now starting again with contest and small amount real account. So yes, I'm very pleased to be one of the winners. 3rd place – Mr. Vasiliy Baltyanskiy: Nice to be a big winner of the contest that involves so many people from different countries. How involved in the contest you were – was it taking all of your time? 1st place – Mr. Effendi Setiawan: I'm trading after coming home from work, about 5 hours of my trading in a single day. 3rd place – Mr. Vasiliy Baltyanskiy: Much time was spent on this contest. 2nd place – Mr. Siegfrid Tampubolon: I'm building my technique, focus on one-two pairs only, consistent timeframe and most important to me, discipline. 3rd place – Mr. Vasiliy Baltyanskiy: Success comes to those who put a lot of time and attention to what they are doing. What was your strategy? Have you developed a perfect plan or tried various techniques? 1st place – Mr. Effendi Setiawan: price action,candlestick pattern.averaging. 2nd place – Mr. Siegfrid Tampubolon: I was trying some techniques, with more aggresive action due to the contest. I have one for intraday trading, and another one for long term which is not suitable for the contest. Fortunately this techniques still apply and even better when the contest run. 3rd place – Mr. Vasiliy Baltyanskiy: No particular strategy. I use divergence on the RSI indicator and even luck. 3rd place – Mr. Vasiliy Baltyanskiy: Sure I have encountered considerable loss. But it is actually doesn't matter if you still gain more profit than loss. 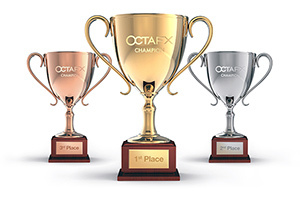 OctaFX would like to thank all the participant and remind everyone else that next time you can be one of OctaFX Champion Demo Contest winners! Don't let anything stop you from getting into the next Round of OctaFX Champion Demo Contest – prove yourself to be a successful and thoughtful trader, reach new heights, and get a reward you deserve – register in Round 24 OctaFX Champion Demo Contest! Spend your luckiest days with OctaFX! King of the Road Top Ten Success Stories! As every award has reached its winner, we would like you to hear direct voices of every TopTenner, talking about the experience of OctaFX King of the Road real account contest. OctaFX awarded Best ECN Broker Asia 2014 by Global Banking & Finance Review! Our first award this year if from Global Banking and Finance Review! OctaFX is proclaimed Best ECN Broker Asia!